In preparation for its final day on Kickstarter , the team behind Sui Generis have released a new video showing off more of the game's physics-driven swordplay. Sui Generis is - or rather hopes to be - a medieval open world RPG that the developers ambitiously claim is like "Grand Theft Auto meets Morrowind." The game's main selling point is the high fidelity of its combat, which models the force and collision of every hit to procedurally ragdoll the characters around. This latest update shows off more of the battle engine, as well as Bare Mettle's first attempt at implementing blood spurts. It's brutal stuff, with the second fight against a mace wielding behemoth looking particularly impressive. Even at this early stage, you can really feel the force of the giant lump of iron smacking the player about. 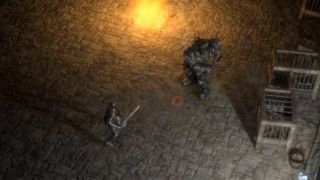 The video also features the team's experiments with shield blocking and fire. Not just your regular fire, either - this is your fancy-pants procedural, volumetric fire. As of writing, there's 36 hours left for Sui Generis to generate just under £30,000 and hit the £150,000 target. Not impossible by any means, especially with the inevitable late-day backer surge, but it's going to be a close one. If you like the sound of being batted around with medieval weaponry, you can back Sui Generis at its Kickstarter page .